The IT equipment maker has demonstrated an image-processing technology that allows cameras to see through darkness as well as fog or mist. It can also help illuminate subjects or scenes that are backlit by the sun. 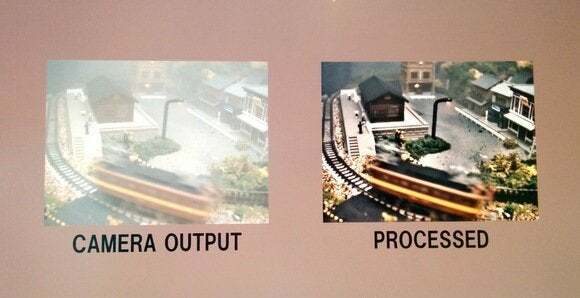 At an NEC tech fair in Tokyo this week, the company is showing how the system works using model trains going around inside a box that’s dark and another box that’s foggy. The system uses ordinary digital video cameras connected to a server. A large monitor shows the input video feed of the trains in the dark and fog. Beside it is another video with the cleaned up imagery, in which the trains and miniature buildings in the background are clearly visible. While Sharp and Sony have developed security cameras that use infrared lighting to see in near or total darkness, NEC’s approach uses image-processing algorithms that separate noise from objects in the scene. The “de-hazing” technique involves differentiating between geometric shapes and elements in the scene that are characterized more by texture. “The geometrical elements undergo processing to boost brightness and improve degraded contrast due to poor weather conditions, while the texture elements are subject to processing to reduce sensor noise, which is especially prominent in shadows and during poor weather,” a spokesman for NEC’s Central Research Laboratories said via email. Since the technology isn’t housed in the cameras themselves, it could be applied to consumer cameras, an NEC staffer at the demonstration said. Applications for the know-how could include security monitoring at airports and along railways, as well as cleaning up imagery from satellites. The company said it has provided the technology to some clients for surveillance purposes, but would not comment further on its commercialization.